Flirtology is latest book from the world’s leading Flirtologist Jean Smith. It is the step-by-step dating guide to mastering the art of flirting for the 21st Century. Master the art of flirting! 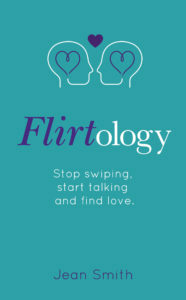 Flirtology is THE dating guide for the twenty-first century. in an age of swiping left and right, and hiding behind online profiles, this book shows you how to replace connectivity with connection. Jean Smith is a social and cultural anthropologist and is the world’s leading authority on flirting. In Flirtology she debunks the myths that surround flirting in order to help you find love and make more connections. It helps you analyse what you are looking for in a potential partner, show you how to practice your interaction skills, and how to unlock your inner flirt. It will give you the confidence to speak to anyone, anywhere and get results – without ever compromising who you are. It’s not about games, rules or tricks – it’s about presenting your real self so that you will attract the right people for you. I loved this book. It’s so refreshing to hear a different take on flirting and just the general meeting and speaking to people. I love Jean Smith’s voice in it, it’s brilliantly easy to follow and she has some incredible tips and advice to impart. Even if you’re in a relationship, it’s the kind of book you’ll tap into regularly just to buff up your communication skills. Buy it. – Tracey D.
This friendly and insightful page turner gives a concise guide to being more sociable in the most complicated realm of dating. Although the basis is about finding romantic relationships, the learnings are easily adaptable to all social interactions. – Russ C.
Jean Smith’s energy and academic heft merge to make one fantastic (and extremely useful) read. – Lesley H.